The tower and chancel are C13. The arcades and clerestory were replaced in the C14, but the aisles were rebuilt in the C15 or C16. 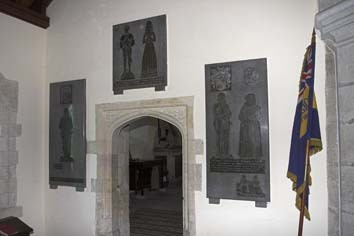 In the late C16 north chapel are the Gage monuments. The village lies under the Downs near Firle Place. Confusingly there is no East Firle and the village is often referred to as simply ‘Firle’. A reset round-headed and double-chamfered doorway in the north aisle shows there was a church by the late C12. The nave had reached its present length by soon after at the latest, for both tower and chancel are C13. The tower was originally unbuttressed. Its early C13 arch has square, chamfered responds with hollowed stops and a pointed head of two orders, springing from broaches on the tops of the abaci. 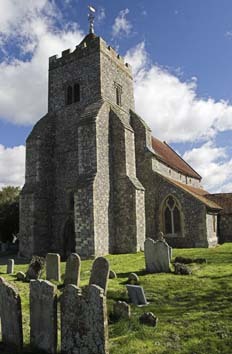 Leeney (in Cook p228) believed the tower, following its other detail, was C16. However, the high quality flintwork, when compared with the undoubtedly mid-C16 tower of Beddingham nearby, suggests it is C13, though the thinner upper west wall may be rebuilt. The chancel, despite C19 alterations, has south lancets and a related piscina (see below), showing it is C13. In the south aisle a C13 doorway, with a filleted roll-moulding on the head, roll-moulded jambs and a label with carved stops, may remain from an earlier aisle. The aisles were rebuilt or added in the C14, with four-bay arcades on octagonal piers, matching responds and double-hollow-chamfered heads. The broad chancel arch was rebuilt then, with a head of two moulded orders, the more complex inner one on semi-octagonal shafts attached to the responds. A cinquefoil in the east gable (recorded as blocked in 1867 (B 25 p947)) is related to the clerestory at Beddingham. 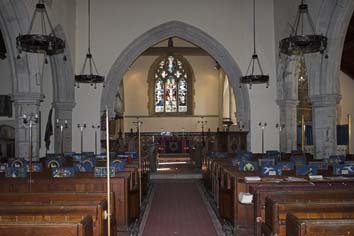 Both aisles had three-light east windows which were later reset; the south one when the aisle was extended to overlap the chancel in the C15 whilst the north one is now the east window of the C16 Gage chapel. 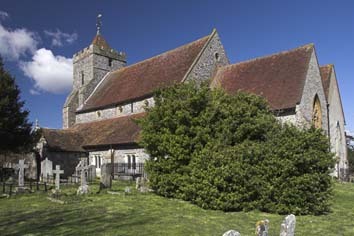 The curvilinear tracery, especially the elongated ovals, resembles that associated with Ardingly, West Sussex and elsewhere. Probably at this time, massive angle-buttresses were added to the tower, initially at the south west angle only. The uncusped, square-headed aisle windows are late C15, when the south aisle was extended eastwards, giving access near the chancel arch to a rood-stair, of which the blocked lower entrance remains. Both Sharpe Collection drawings (one undated, the other 1803) show two-light clerestory-openings. The south porch of flint and stone chequer with a moulded arch is C16. So, probably, was the east window of five trefoiled lights that is shown on the Sharpe drawing of 1803. Finally and possibly connected with the work on the aisles, the tower was remodelled, with uncusped, square-headed windows and bell-openings (the west one is double), a chamfered doorway in a square hood, battlements and tiled cap. The north chapel dates in its present form from c1595, though Nicholas Antram (BE(E) p381) suggests on the evidence of the gables that it may have been altered from an existing structure. As it now stands, the chapel was built by John Gage the younger to house the Gage family memorials (see below) and beneath it is the family burial vault (3 p5). It is broader than the chancel. Apart from the re-used east window, the north one resembles those of the aisles and is probably a conscious copy, rather than a sign that the aisles were remodelled at this later date. The chapel keeps its original roof, with a crownpost and a moulded tiebeam with foliage in the centre. The entrance then was through a four-centred doorway from the aisle, with shallow mouldings and foliage in the spandrels; this arrangement demonstrates the separate ownership of the chapel by the Gage family. In the C17, angle-buttresses were added on the north side of the tower, matching those to the south. There were no further major changes until the C19, though early in that century Horsfield (I p338) describes a pulpit set in the chancel arch, with a passage either side. At a restoration in 1867, G M Hills worked on the nave and aisles (B 25 ibid), with new west windows (though the stonework of that of the north aisle looks in part older, particularly the rere-arch) and higher walls in the aisles. Possibly at this time the south west aisle window was replaced with by one one with a depressed four-centred head and panelled tracery. Even if this window is excluded, the stated total cost of the restoration work at this time, £749 (KD 1899), is likely to be an underestimate. If the pews in the nave were part of the work, the doors to each are a late example of this arrangement. Hills based his cinquefoiled clerestory on the C14 east gable opening and replaced the roofs. 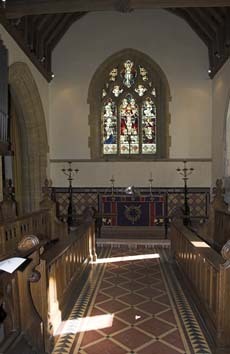 The only change he made in the chancel was new floor-tiles. It was subsequently further restored in 1884 by R T Creed, along with the Gage chapel (CDK 1884 pt 2 p154). 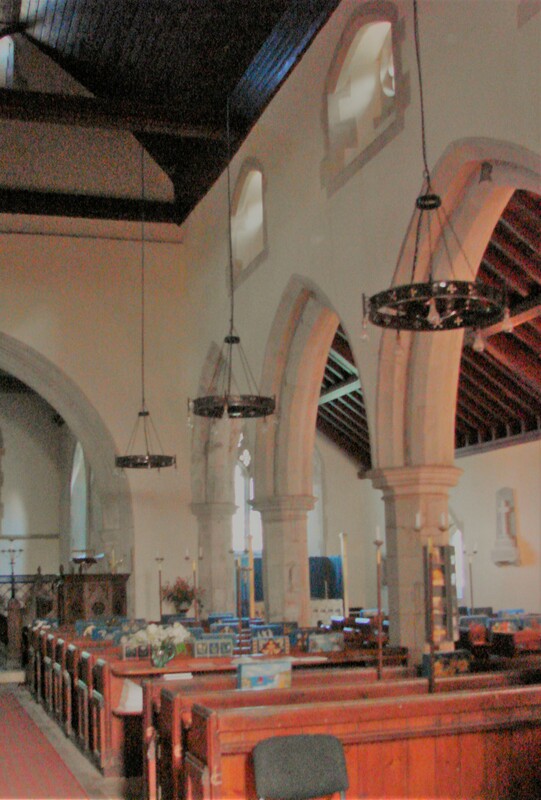 The chancel roof is new and an arcade to the chapel replaced the previous ‘mean partition’. The account of this work (ibid) does not mention the exterior, but the south wall was refaced and the east one rebuilt with a window of curvilinear tracery. 1. (East end of north aisle) Bartholomew Bolney (d1476) and his wife. Small figures, belonging to Series D (see London workshops). Through their daughter and heiress, West Firle passed to the Gages. 2. (North chapel, west wall) Late C16 male armoured effigy and plates with inscription etc. Thought to be George Gage, son of Sir Edward Gage; also small. 3. (North chapel, west wall) Thomas Gage (d1590) and his wife. Similarly small figures commemorating another son of Sir Edward. (All three of these were mounted in their present position after being found loose (TMBS 6 (1910-14) p207)). Nigel Llewellyn suggests these were originally in settings and were related to the monuments commissioned by John Gage in 1595 (see under ‘Monuments’ below) (3 p6). 4. (East end of nave) Mary Howard (d1638). Brass plate depicting a shrouded figure. Font: Square, with and an incuse quatrefoil on each side of the bowl. The bowl looks all C19, but the square stem, which has arcading on three sides, could be at least in part old, probably C15. 1. (Head of east window of south aisle) C15, including several complete angels. 2. (South aisle, first window) J Powell and Sons, designed by J W Brown, 1885 (Order book). Single figures in rather sombre colours. 3. (North aisle, first window) Kempe and Co, 1914. 4. 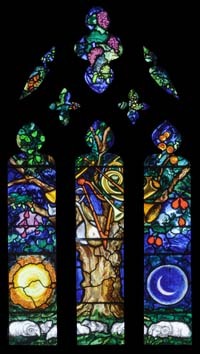 (North aisle, second window) G Maile and Son, 1939 (WSRO faculty). 5. (East window) J Powell and Sons. Crucifixion, designed by H Holiday, 1887 (Hadley). 6. (Gage chapel, east window) Designed by J Piper (Vigar p73) and made by D Wasley, 1985 (www.stainedglassrecords.org retrieved on 22/2/2013). It depicts the Tree of Life in the heavenly Jerusalem. Mass dials: (Outside north doorway) The position is curious since it was on the shady side of the church and cannot be original. The monuments in the north chapel to the Gages of Firle Place by G Johnson of Southwark were all erected about 1595 by John Gage (d1598), which explains the similarities although those commemorated died over a period of almost 40 years. Llewellyn (3 p6) suggests that Gage was motivated by his strong recusancy (though he remained politically loyal to the Queen) and lack of a direct heir, together with the death of his second wife in 1595. The Firle Place records include Johnson’s drawings (they are now in the ESRO) show that he alone was responsible (1 p162) and also demonstrate Gage’s close interest in every detail. Though the Gages prospered after the dissolution of the monasteries, their loyalty to the old religion never faltered and John Gage himself was punished more than once. This loyalty is shown by the inscriptions seeking mercy on the souls of the departed; unusually for the date these are in Latin. Llewellyn (p379) notes the similarities with the monument of c1593 to Anthony, Lord Montagu, now at Easebourne church, West Sussex. This is also ascribed to Johnson and the Gages and the Montagus were closely linked. 1. Sir John Gage (d1556 – wrongly dated 1557 (Mosse p76)) and his wife. Alabaster effigies lie on partly rolled up mats, which form headrests. The tomb-chest is very plain. 2. 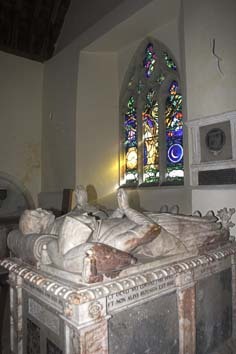 Sir Edward Gage (his son (d1569) and his wife). Brass effigies shown praying, beneath an arch containing the inscription on a brass plate. 3. John Gage (son of Sir Edward (d1598) with his two wives). This also has small brasses and the design is the same as the monument to Sir Edward. 1. (Chancel, under the south east lancet) C13, broad with a rounded trefoiled head. 2. (South aisle, east end) Square-headed and plain, probably C15/C16. Stoup: (South porch arch) C15 with a trefoiled head.